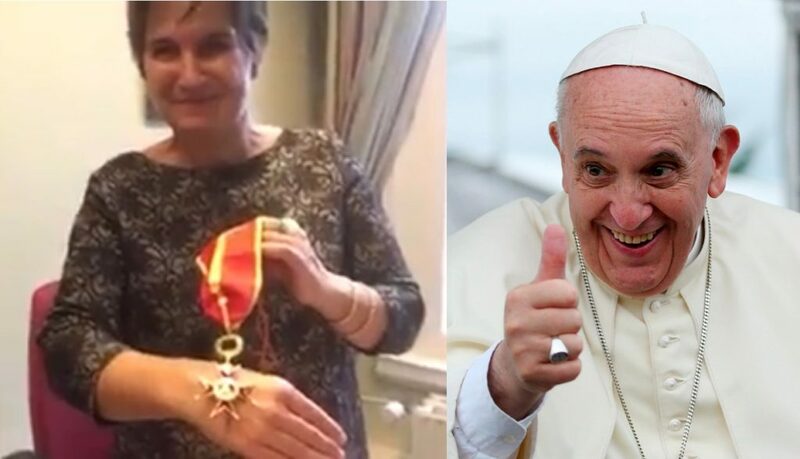 On January 12, reports began surfacing on Twitter that Lilianne Ploumen, former minister for Foreign Trade and Development Cooperation in the Netherlands, was honored by Pope Francis with the title of Commander in the Pontifical Equestrian Order of St. Gregory the Great. The Lepanto Institute was able to confirm from a December 22, 2017, Dutch radio broadcast that Ploumen indeed received the honor. In a brief video clip promoting the broadcast, Ploumen displays the medal while saying that she received it from the Pope. BNR: And this is the umpteenth prize that Lilianne Ploumen observes, won in 2017 and from whom they came. Ploumen: Yes, it is a high distinction from the Vatican; from the pope. Ploumen: It is Commander in the order of St. Gregory. BNR: And that despite that you are pro-abortion. Ploumen: Yes, you can check. To say that Lilianne Ploumen is “pro-abortion” is an extreme understatement and doesn’t even come close to the scandalous reality of her activism. In January 2017, after U.S. President Donald Trump reinstated the Mexico City Policy, Ploumen launched a new NGO called She Decides to provide mass amounts of funds to organizations that would no longer receive funds from the U.S. government. The Mexico City Policy automatically denies U.S. funding for international organizations that perform or promote abortion. By July 2017, Ploumen’s program had raised more than $300 million. It is worth noting that from 2004 to 2007 Ploumen was the director of programs and on the board of directors for CORDAID, the Dutch Catholic aid relief agency that was caught funding Planned Parenthood and dispensing contraception. In February 2010, Ploumen called on LGBT activists to descend upon and disrupt Mass at St. John the Baptist Cathedral, wearing pink triangles with the words “Jesus excludes no one.” The reason? She and other pro-LGBT activists were protesting the Church’s moral teaching regarding homosexuality. It remains to be seen what service Lilianne Ploumen has provided for the Catholic Church or the Holy See, given her staunch support for homosexuality, abortion and contraception. Given that the one thing that Lilianne Ploumen is known for in the past year is the establishment of a fund that provides hundreds of millions of dollars to organizations that commit abortion and dispense contraception, it is difficult, if not impossible, to separate her recent Pontifical honor from this grievous and scandalous act.